Nissan has teamed up with the fastest man in the world, Usain Bolt, to build and sell a car for his charity, the Usain Bolt Foundation. 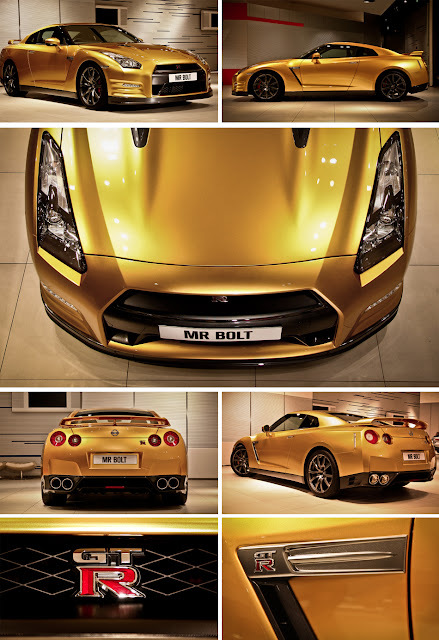 The 2014US(2013 rest of the world) Nissan GT-R has been painted a unique color - Bolt Gold. Bidding starts at $120,000, and it is a 10 day auction. The Nissan GT-R® is a multi-dimensional performance machine that lives up to the concept of “the ultimate supercar that can be driven by anyone, anytime, anywhere.” Since its introduction to the Japanese market in 2007, the Nissan GT-R® has gone through continuous evolution but always remained cutting-edge. It has also been acclaimed globally, winning more than 50 top awards in various categories. Olympic gold medalist Usain Bolt and the Nissan GT-R® are both known for their unforgettable performances on the world stage. On October 11, 2012, Nissan brought the two together when it unveiled the gold GT-R®, in honor of their new Director of Excitement—Mr. Bolt. Now, all the power, speed and performance of this unique supercar—painted in Bolt Gold—could be yours. With 550PS* and a torque of 632Nm/3200-5800rpm*. It also has a revolutionary 4WD system that makes it the supercar that anyone can drive. All proceeds from this charity auction will be donated to the Usain Bolt Foundation. It’s yours for the taking. Are you ready to go for Bolt Gold? Once the winning bid is final, your GT-R® will be built to your region’s specifications and requirements, and then delivered to the nearest dealership. Only available to bidders in regions where the GT-R® is sold.